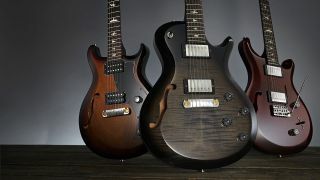 As PRS announces a new, semi-hollow take on S2 models - the S2 Mira, Custom 22 and Singlecut - it seems yet another big brand is jumping on the 'semi' bandwagon. But PRS has plenty of prior history over its near 30-year life. We spoke to the guitar-maker about its previous semi-hollow endeavours and the popularity of the S2 range. "We are seeing a great interest in semi-hollow guitars across all of our product lines, from Private Stock custom pieces to the SE Zach Myers, and we are as excited about these guitars as anything we've made so far inside of S2," beams Jack Higginbotham, president of PRS Guitars. "Like all the S2s, the goal of these semi-hollow models is to bring inspirational, reliable, quality tools to players at a new PRS price point." Some might say it's about time too, because the gap in price between those high-ticket USA Private Stock guitars and the lowly Korean-made SEs is, frankly, massive. The truth is, it's taken PRS nearly 30 years to put a standard, f-holed semi into its USA production range. "In the year since the S2's launch, PRS has shipped 'just over 7,100' S2 instruments"
PRS has pumped air into its guitars from very early in its life, with the 1989 Limited Edition; during the 90s, a 'semi-hollow' body - without an f-hole - was an option on the Custom: more recently, we've seem limited- edition models such as the 2010 22 Semi- Hollow, the 2013 408 Semi-Hollow and the Custom 24 Semi-Hollow. The SE range has had its Custom Semi-Hollow - with P-90s and humbuckers - since 2007, though that's recently been retired leaving the new SE Zach Myers as the sole SE semi. Since 1998, PRS has had its shorter-lived Archtop and still-current Hollowbody, which aside from a solid post under the bridge connecting the top with the back are completely hollow and feature two f-holes, while also in the current USA core line are the NS-14 (there was previously an NS-15, too) semi-hollow Neil Schon model and the JA-15 archtop hollowbody designed with Paul Jackson Jr.
With the exception of those latter two models, all the prior and existing semis, and the Hollowbodies, have used PRS's existing outlines rather than creating a new-design semi. The firm admits this limits the size of the air cavity and that the cavities in the S2 are simply based on "the other semi-hollow guitars we have run in the past." With its Gretsch-like pickups and Bigsby vibrato, the S2 Starla seemed a prime choice for a similar semi treatment, in light of the view that: "the biggest surprise to us has been how well the S2 Mira and Starla have been received by artists, dealers and musicians." However: "when we were designing these new guitars, aesthetically, the f-hole did not work with the pickguard on the Starla. Never say never, though: we just haven't nailed it yet." Another thing that might have suited especially the Singlecut Semi-Hollow is the fully adjustable Stoptail bridge, Zach Myers' favourite, which he has fitted on his SE. "We tried both bridges on the S2 Singlecut Semi-Hollow, and in the end we preferred the aesthetic and the sound of the standard bridge: less moving parts equals more solid tone," we're told. There's much more to come from PRS's S2 range, backed up by production figures. "We're at about a 60/40 split in favour of the core-line guitars, but we hope to finish the year at more of a 50/50 split." And in the year since the S2's launch, PRS has shipped "just over 7,100" S2 instruments. It seems PRS has cottoned on to the fact that not all of us are 'doctors and dentists' - or indeed rock stars - but just aspiring musicians who love our guitars. Better late than never!